Tom Lambert and his wife Ann built this net-zero house in Pulaski, New York, after Tom took a 10-week course from Marc Rosenbaum. Image Credit: Tom Lambert A design concept for the house clearly marked the home's continuous air barrier and showed insulation details. The house includes a porch with a fireplace. The porch will eventually be screened. 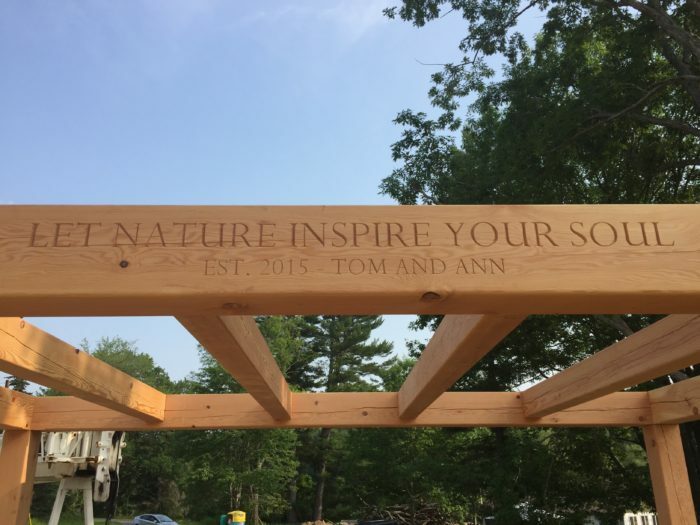 Tom and Ann Lambert's desire to build an energy-efficient home and reduce their carbon footprint came to fruition after Tom's retirement from Xerox. He enrolled in an online course and eventually formed a new energy modeling and consulting company. Cabinets, flooring and interior millwork were made from site-harvested black cherry and white oak, as well as reclaimed elm lumber. 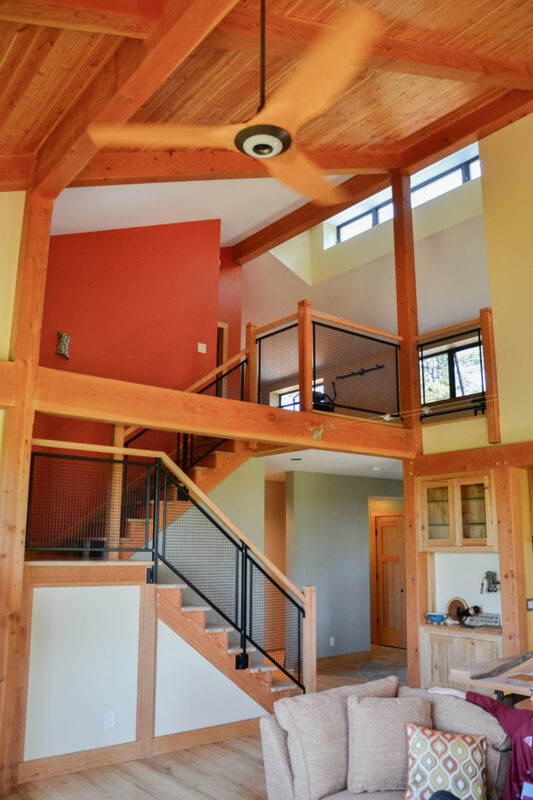 The hybrid timber frame is built from Douglas fir. The ground-mounted photovoltaic array has a rated capacity of 10.2 kW and is expected to produce 12,700 kWh of electricity per year. 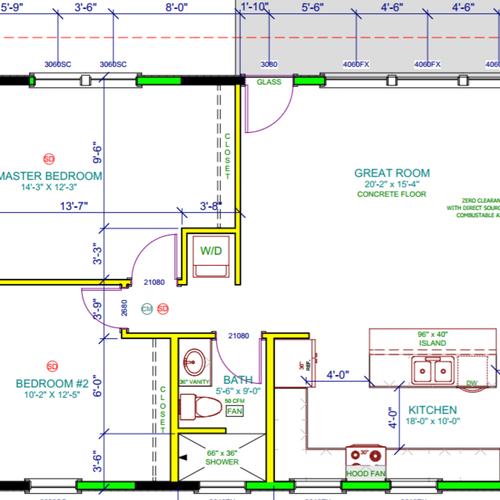 Can you really build a net-zero-energy house based on information learned from an online course? The short answer is yes, and we have CreekSide Net Zero to prove it. 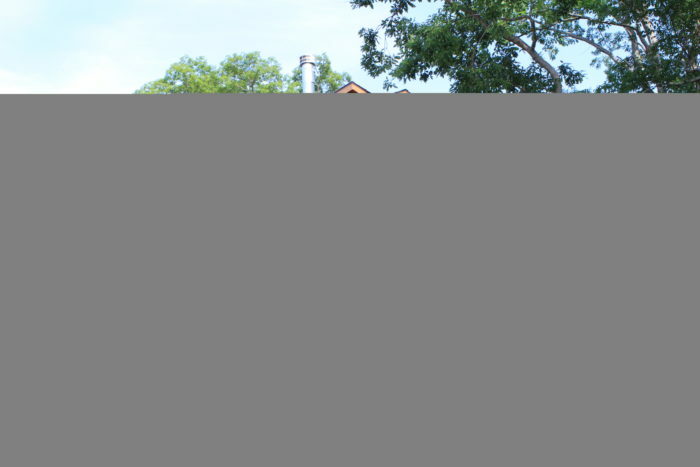 My wife and I are often asked two questions: Why did we build a net zero energy house? How did we know how to build it? 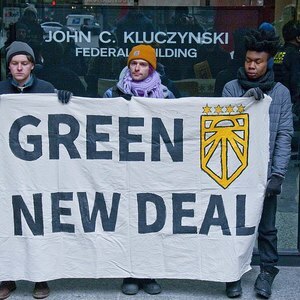 The “why” is really an evolution of our values — of “walking the talk.” We have always been eco-minded and dreamed of doing something with alternative energy to reduce our carbon footprint. Our first thought was simply to build an energy-efficient retirement home without completely understanding what that meant. Being family-focused, we chose property in Pulaski, New York, a few miles down the road from our daughter’s family and two energetic grandsons. As for the “how,” after I retired from Xerox in 2013, I spent a lot of time researching green building and high-performance houses. I visited informative websites such as Green Building Advisor, Fine Homebuilding, and Building Science Corporation. Coming from an engineering background of well-defined design methodologies, I was eager to explore and found it interesting how much discovery is still taking place in the field of building science. 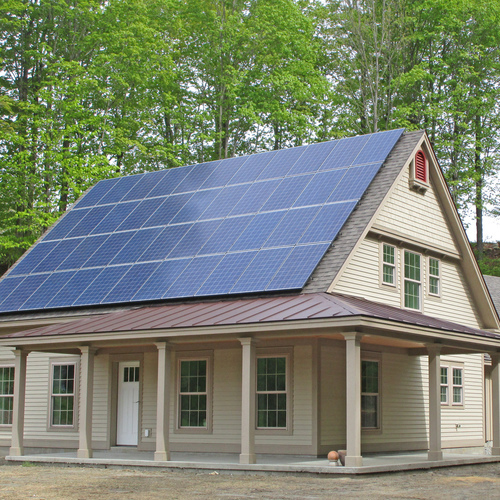 Is NIST Serious About Net-Zero-Energy Homes? After many hours online and just “one more click,” I found the Northeast Energy Sustainable Energy Association (NESEA) and HeatSpring sites where I was drawn to information on Marc Rosenbaum’s zero net energy homes course. This was our answer to the “how.” What better way to learn than to be guided by a widely recognized expert like Marc, who could provide speedy tips and practical knowledge based on actual experience, and to benefit from the lessons learned from others taking the course? Without hesitation, I signed up for this 10-week BuildingEnergy Masters Series course that covered everything from heat loss and energy modeling to solar energy, infiltration, and ventilation. But our dream was bigger than just building a net-zero energy house. We also wanted a house that was aesthetically pleasing. My wife Ann drew upon her art background and design experience from her current project management role at Wegmans to provide sound creative design direction focused on feng shui principles. 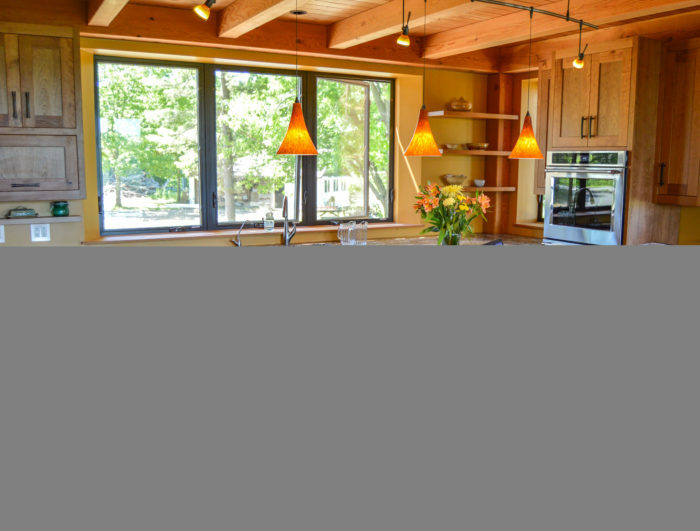 Net-zero houses tend to be designed as simple boxes for efficiency reasons. However, it was important to us that our home be built in harmony with the environment and nurture our creative spirit. That’s why partnering with New Energy Works Timberframers (NEW), a company that shares our values, seemed like a perfect fit. We ultimately decided on a hybrid timber frame which combines traditional stick-building elements with the age-old craft of timber framing. We weren’t sure how to make it work, so this was the start of our CreekSide Net Zero House journey. We went to NEW with requirements and specifications on the envelope and overall design. This included wall and roof construction, site orientation, mechanicals, ventilation, and air-sealing concepts. 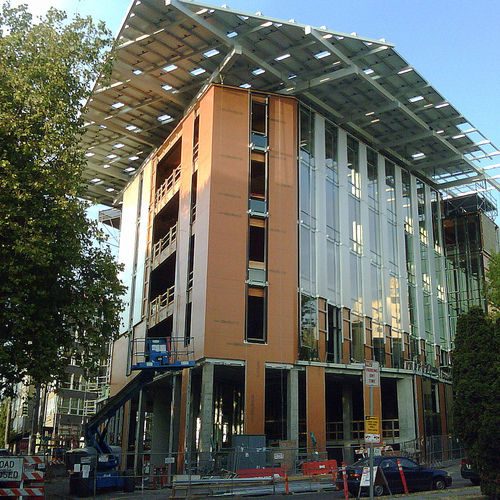 Although NEW was already focused on building energy-efficient homes, they had never designed a net-zero-energy house. Equipped with my engineering background and newly gained knowledge from Marc’s class, I felt qualified to provide overall direction throughout the project. My primary focus was the envelope. One of the most important things I learned in Marc’s course is that the envelope design is critical to energy efficiency. Therefore, implementing a robust design with a good air barrier to enable a tight building envelope was key. We had multiple design enclosure meetings with the teams from NEW and Airtight Services, Inc., both experts in Passive House consulting, to collaborate on the implementation details for the envelope design. Throughout the design process, I utilized and updated Marc’s Zero Net Energy Model calculator to better understand the energy impacts of any design changes we made. Below is my initial sketch that illustrates the design concept that architect Ty Allen and the NEW team used to start developing more detailed drawings (see Image #2, below). One of the concerns with double wall construction is the risk of condensation building up and increasing the moisture content on the inside of the exterior sheathing. To address this concern, the Airtight Services team recommended that we modify the design to include a continuous vapor retarder membrane called INTELLO Plus on the outside surface of the inside wall. I supplemented what I learned from Marc’s course with HERS rater training at Performance Systems Development (PSD) in Ithaca, New York. Using new skills gained from this training, I did a blower-door test for our home. After installing windows and cellulose insulation and air-sealing our home, we achieved an infiltration rate of 0.28 ach50, which is 53% lower than the Passive House Institute U.S. target. Needless to say, this rating impressed our Passive House friends from Airtight Services. To help minimize our carbon footprint we were mindful about our material selection. We used LED lighting throughout the house, rubber roofing made from recycled tires, and harvested black cherry and white oak from our site for various counters, cabinets, and benches in our house. We also used reclaimed wood purchased from Pioneer Millworks, NEW’s sister company, for other millwork including beautiful elm flooring; single-track, mixed hardwood “barn” doors; and an accent wall. We also tried to select low-maintenance materials to facilitate aging in place in our home. 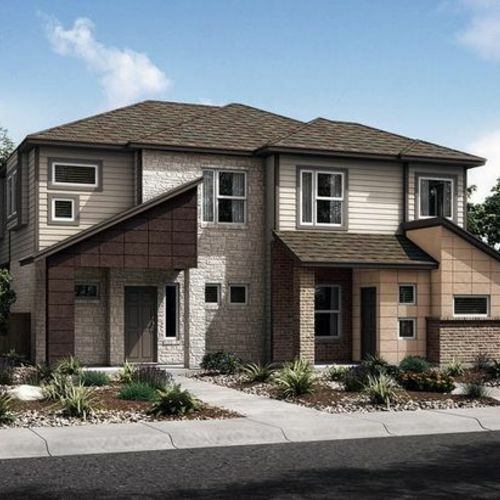 We hope that our project inspires others to see the possibility of building their own net-zero-energy home, or that it at least provides others with ideas for how to be more energy-efficient and sustainable. I know that the skills I learned from Marc’s course, coupled with our passion to build a house with a soul, has allowed us to walk the talk and build our dream — our CreekSide Net Zero home. Overview: 2,853 sq. 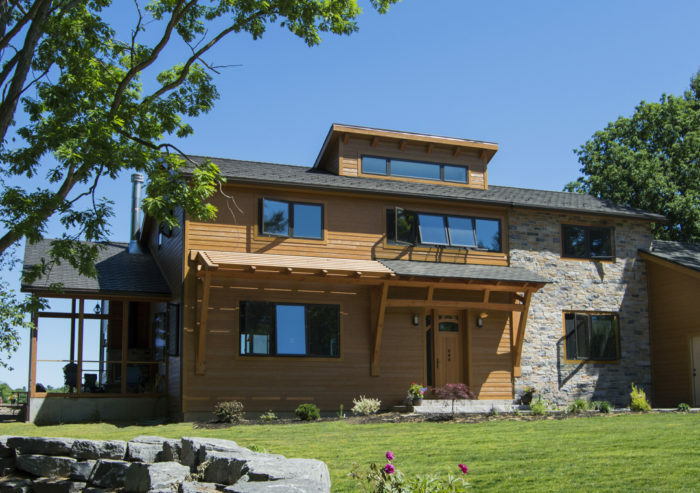 ft. hybrid timber frame using Douglas fir for the frame, site-harvested black cherry and white oak for millwork by NEWwoodworks and Wisteria Wood Works; and reclaimed elm for flooring and cabinetry, by Pioneer Millworks and NEWwoodworks. Completed in 2016.The house was designed by architect Ty Allen at New Energy Works. Windows: Inline fiberglass frames with triple glazing (U-factors from 0.15 to 0.17; solar heat gain coefficient from 0.26 to 0.41). Insulation: Subslab, 4 in. EPS (R-16); foundation walls, 2 in. EPS and 4 in. 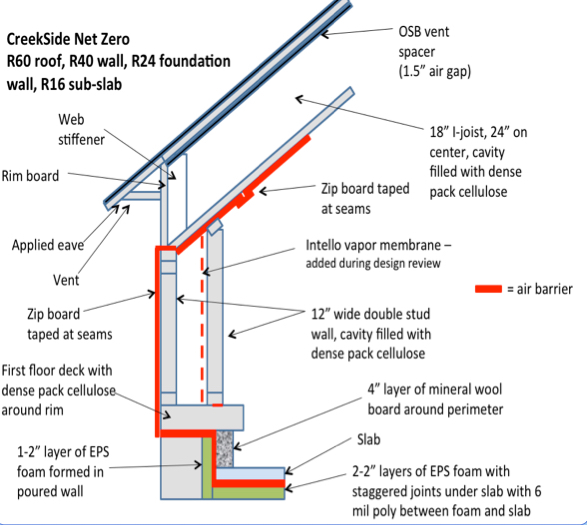 Roxul mineral wool (R-24); 12-in.-thick double-stud walls (panelized) with dense-packed cellulose (R-40); roof assembly, 18-in. I-joists with dense-packed cellulose (R-60). Appliances and mechanicals: Zehnder ComfoAir 350 energy-recovery ventilator, Whirlpool heat-pump clothes dryer, GE GeoSpring heat-pump water heater. Renewable energy: 10.2-kW ground-mounted solar array consisting of 36 SolarWorld 285-watt panels and Enphase M250 micro-inverters. 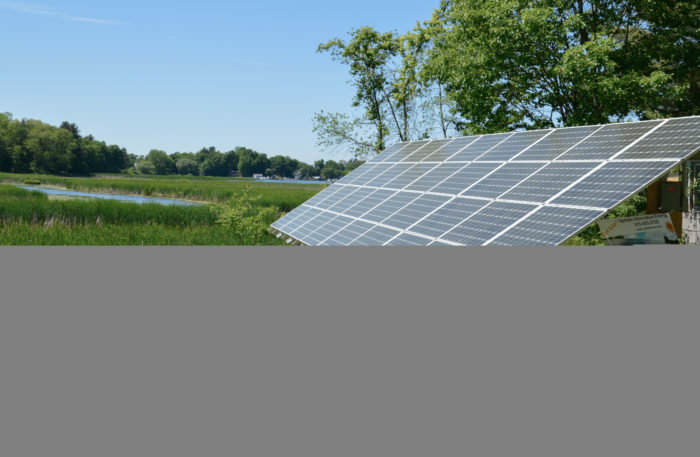 Projected PV production is 12,702 kWh per year. Heating and cooling: Mitsubishi MXZ Hyper-Heat three-zone condenser with M series air handler and two Hyper-Heat wall units (one mounted in workshop). Tom Lambert retired from Xerox in 2013 after 32 years in numerous roles, ultimately serving as manager of the worldwide launch organization and responsible for the introduction and delivery of new products. 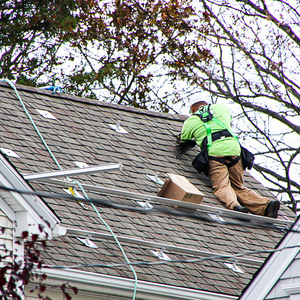 He has reinvented himself as owner of CreekSide Energy Solutions, a company he started to provide residential energy modeling and consulting services. Tom is a certified HERS rater and Energy Star Builder and currently consults with NEW as a program manager. This article originally appeared in the Fall 2016 issue of Building Energy, a publication of the Northeast Sustainable Energy Association. Great looking house, inside and out. Love the screened porch. Like that you were able to have a separate ground-mounted array. Looks like a lovely place to live, and with those specs (and results, especially 0.28ACH50), should be comfy. How do the timber frame components fit into the cross section of Figure 2? How did the insulation installer access the roof cavities? I enjoyed the personal story behind the house story. We are in a similar position. We are not retired, but are in the later stages of our careers and have grown children. After reading GBA, BSC, and taking a few HeatSpring classes, I designed our house. Although our builder didn't typically use the techniques I specified, he was open to doing things a little differently. Finding such a builder took some searching. His framing sub contractor was cooperative about the new methods and executed them well. Some of the other subcontractors were not so open to doing things differently. I have maintained a blog about the house at http://lindenairporthouse.blogspot.com. 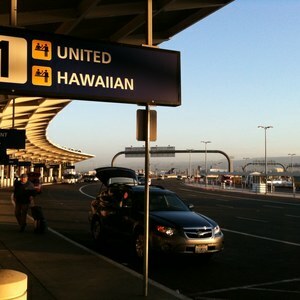 One of these days, I will get around to composing a summary as a guest post here. Very happy to see the result! Tom did an excellent job with the build, and Ann has an amazing taste for interior design. 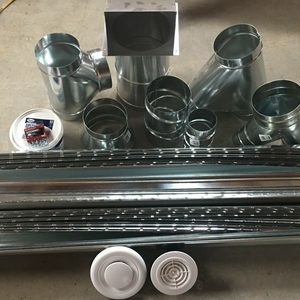 Shows that if you really take the time to educate your self on these things you can do a better job than many contractor's who have not taken the time to educate themselves on best practices or just don't believe in them. Building air tight well insulated homes takes a lot of extra work and is more risky than building a home to code. I saw first hand how well this place was insulated when I stopped by and Tom was heating his home with two small plug in electric heaters on a five degree day and it was comfortable. The wood work is amazing. Gutters are pretty nice too.